This post has been sitting in my inbox for a few weeks now because I simply couldn’t find the right words to explain the significance of this recipe to my family. I’ve finally decided that the more is less approach is the best way to tell this story. This is my grandmother’s pecan pie bar recipe. I remember watching her make them standing on a stool pulled up to the kitchen counter. My daughter has been making it with my mom since she was tall enough to stand on that same stool to reach a kitchen counter. Back in September my daughter and I made batches of these bars for a local bake sale to benefit those ravaged by the Texas wildfires. She’s too tall now to need that stool. The circle is complete. 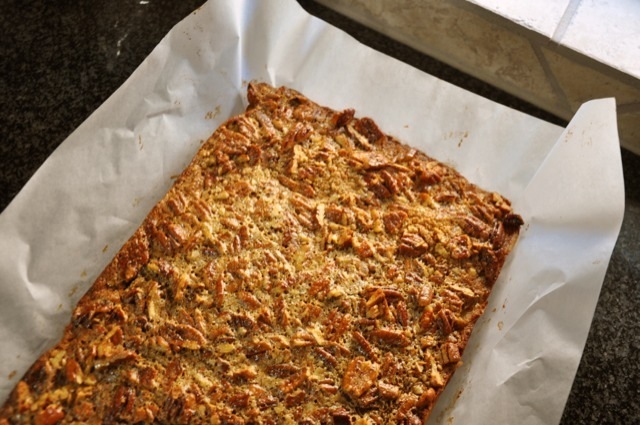 And sometimes a recipe for pecan pie bars is so much more than a recipe. It’s a tradition. A connection. I look forward to the day that I get to make these same bars with my grandchildren. All the fun of pecan pie in bit size bars. Preheat the oven to 350 degrees. Cut a piece of parchment large enough to fit with a 1 inch overhang on all sizes in a 9×13 inch or 12×15 inch glass baking dish. Cream the sugar and butter together in a mixer on medium speed until fluffy, about five minutes. Add the vanilla and egg. Mix until well combined. Add the flour in batches until well incorporated into the butter. The dough will be crumbly but should stick together when you press it between your fingers. Place the parchment on the counter and dump the dough into the center of the parchment. Pat the dough evenly across about 3/4 of the parchment. Place the parchment into the glass baking dish and finish pressing the dough around until it’s covers the bottom of the pan evenly. Bake the dough for 10-15 minutes or until the edges are light brown. While the dough bakes, make the filling. In a medium bowl whisk together the brown sugar, corn syrup, vanilla, and eggs until well blended and smooth. Stir in the pecans. Remove the crust from the oven and pour the pecan mixture over the top. Use a spatula to spread it evenly over the crust. Return the pan to the oven and cook for 25-30 minutes or until the center of the bars are set. Remove the pan from the oven and lift the parchment and bars out onto a counter (if it’s heat resistant) or a cutting board. Run a spatula between the bars and the parchment to loosen them but don’t remove the bars from the parchment. Transfer the parchment to a cooling rack and let the bars cool completely. Cut into 36 servings. The bars will keep in the refrigerator for up to a week. It may seem excessive but don’t leave out the step toward the end where you loosen the baked bars from the parchment. These suckers are sticky and you’ll find yourself pulling pieces of parchment off of cooled bars if you don’t separate them from the parchment when they are warm. The newest version of corn syrup doesn’t have High Fructose Corn Syrup so you can make these bars and not worry about HFCS. This is a recent devlopment so if you’re using a bottle of syrup from your pantry double-check to be sure it doesn’t have HFCS.